The College of Humanities and Fine Arts invites students of all class years and majors to engage with career events, workshops and resources that will help them gain skills and pre-professional experience for after graduation success. During your first semester here, pay attention to your studies and get comfortable being here at school. Starting in your second semester learn how to write a good resume so you can have it on hand when you begin to reach out and investigate the career experiments you want to embark upon. Go to employer info sessions, attend alumni panels, learn how to do informational interviews and talk to all sorts of people. 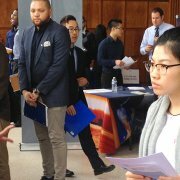 Chat with employers, of course, but also professors and seniors and graduate students and parents of your classmates. Get a job where you do real work, and head into the summer thinking about doing a small internship next to a paid job. As you go through your sophomore and junior years consider looking into specific employers to do more involved internships or co-ops. You don’t have to pick the RIGHT employers or internships, it’s more important to get out in the world, experiment with different kinds of work and learn from these experiences. In your junior year start to firm your focus on a career path, and consider whether or not it might include grad school. During your senior year you can do another internship, and attend a career fair or five, and participate in On Campus Recruiting. At this point you will have a much better idea of what you will do and what opportunities you can reach towards. Graduate students are welcome to participate in all career events and workshops, to utilize the online resources, to attend WalkIn, and make career strategizing appointments one-on-one with the career adviser.